Congratulations to the Winner of our Autographed Chris Young CD Giveaway! Congratulations to our giveaway winner, Melissa Forcum. 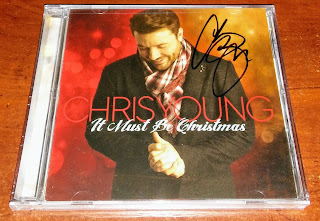 You will receive your autographed copy of Chris Young's It Must be Christmas on compact disc via USPS soon!!! Thank you to all who entered. Stay tuned for more great giveaways! Next one up will be a Members Only exclusive so join now! This giveaway is not sponsored by, endorsed by, or in any way connected with Chris Young or the Country Music Association.